DRDO CEPTAM-08 Tier 2 & Trade Test Admit Card 2017 – Download DRDO Technical Asst & Technician Exam Call Letter 2016: DRDO Technician Tier-2 Admit Card is available for download. Are you looking for DRDO Admit Card? Defence Research & Development Organisation (DRDO), Government of India has finally uploaded E-Admit Card of Tier 2 Examination for the post of Technical Asst & Technician posts. DRDO CEPTAM Tier 2 & Trade Test Admit Card Available. DRDO CEPTAM 08 Tier 2 Call letter is finally available for download from today onwards. DRDO Online Examination is one of the much awaited exam of the year. DRDO Technical Asst & Technician exam has scheduled to be held on 16th April 2017. Admit Card for DRDO CEPTAM 08 Tier 2 exam is available at its official website at ceptamonline.org. Candidates can download their DRDO CEPTAM-08 Mains & Test Admit Card at below mentioned link. Centre for Personnel Talent Management (CEPTAM), Defence Research & Development Organisation (DRDO) under Ministry of Defence, Govt. of India, is going to held Tier-II of DRDO Entry Test 2015-16. The online application for Defence Research & Development Organisation (DRDO) 2016 was started during December and January 2016 for filling up 1142 Senior Technical Assistant ‘B’, Technician ‘A’, Stenographer, Translator and other Admin Assistant vacancies. A very large number of candidates have applied for DRDO CEPTAM 08 Recruitment exam. Now that exam is scheduled to be held on 17th April 2017, all candidates are very eager to download their DRDO CEPTAM-08 admit card. Call letter is compulsory for all candidates. Date of Tier- 2 Examination: 17th April 2017. The DRDO CEPTAM 08 Admit Card goes available for download from March 28th onwards. DRDO CEPTAM-08 Mains or Trade Test call Letter will not be send by post or email. So candidates are advised not to wait for DRDO Technical Asst & Technician Exam call letter at your home. They must download DRDO CEPTAM-08 Admit card from DRDO official website manually. Log on to official website at ceptamonline.org. Enter Your Application / Registration No., Date of Birth and Registered Mobile No. or Your Applied Post Code with Name and Date of Birth to Download Admit Card. Download DRDO Technician Trade Test Admit Card. DRDO CEPTAM-08 Admit Card is available for download at DRDO site login. The Admit Card can only be downloaded from the official DRDO websites from 2nd July 2016. Admit Cards will not be sent by post/email. Candidates are advised to bring a print-out of the downloaded Admit Card to the Test Center along with the original and valid photo identification (NO photocopy / scanned copy/NOT expired). Candidates will not be permitted to take the test, if this original and valid photo identification is not presented. It may be noted that you would have specified one of the following IDs during the online application process: Driving License, Passport, PAN Card, Voter ID, Aadhaar UID, College ID, Employee Identification Card, or a Notarized Affidavit with Photo, Signature, Date of Birth and Residential Address. 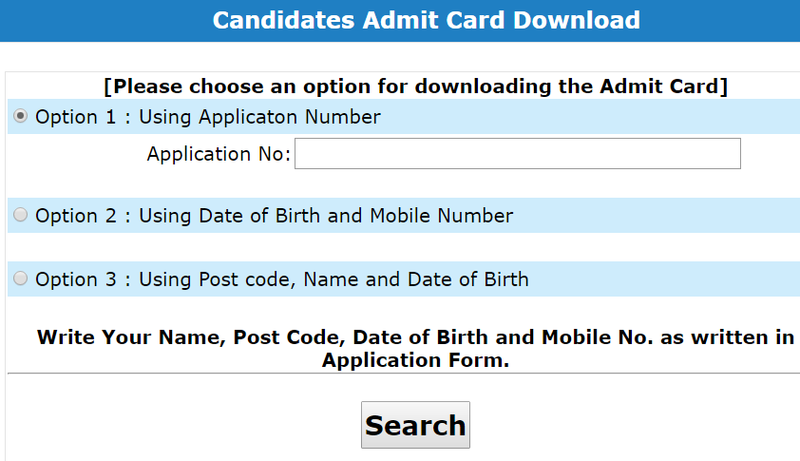 Candidates facing problem while downloading Admit Card are advised to do the following; Empty cache memory of the browser, Close the browser, Re-open the browser and login at DRDO website to download your admit card. Candidates are strongly advised to download their DRDO CEPTAM-08 admit card and take print out of the same as soon as possible. Candidates must take their admit card with them while going for DRDO CEPTAM-08 Tier examination 201. Follow the link given below to download DRDO CEPTAM-08 online exam admit card.